The Intel® Celeron® processor 400 series is a desktop processor that combines the performance of the previous generation of desktop products with the power efficiencies of a low-power microarchitecture to enable smaller, quieter systems. Intel Celeron Processor 400 is a 64-bit processor that maintains compatibility with IA-32 ...software. The Intel® Celeron® processor 400 series uses a Flip-Chip Land Grid Array (FC- LGA6) package technology, and plugs into a 775-land surface mount, Land Grid Array (LGA) socket, referred to as the LGA775 socket. 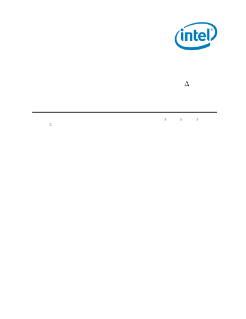 In this document the Intel Celeron processor 400 series refers to the Intel Celeron processors 420, 430, 440, and 450. Based on 65 nm process technology, the Intel Celeron processor 400 series is a single-core processor that features an 800 MHz front side bus (FSB), 1 MB or 512 KB L2 cache, and a thermal design power (TDP) of 35 W. The processor also supports the Execute Disable Bit and Intel® 64 architecture. The processor front side bus (FSB) uses a split-transaction, deferred reply protocol like the Intel® Pentium® 4 processor. The FSB uses Source-Synchronous Transfer (SST) of address and data to improve performance by transferring data four times per bus clock (4X data transfer rate, as in AGP 4X). Along with the 4X data bus, the address bus can deliver addresses two times per bus clock and is referred to as a "double-clocked" or 2X address bus. Working together, the 4X data bus and 2X address bus provide a data bus bandwidth of up to 6.4 GB/s.